The Candela GentleYAG® laser system safely and effectively treats a wide variety of cosmetic skin problems which include spider veins on the face and/or legs and hair removal. Its newest application is facial/neck skin tightening, which has proven to be very effective and exciting. The GentleYag requires no gels and is safe in all skin types. Its safety profile is especially important for permanent hair reduction in our region. In Somerset Count, where heat and sun are an intergal part of our life, the GentleYAG affords safe and effective hair removal regardless of the season. As a precaution, Dr. Soheir Ramadan and Laser and Candela Corp. advise clients to minize sun before and after GentleYAG procedures and wear a sunblock of SPF 30 or greater. When the updated Candela GentleYAG was introduced, it revolutionized the Nd:YAG 1064 Market. It has expanded and improved on safety, power, effectiveness and the capabilities of this particular platform. The GentleYAG is our “workhorse”. Iit effectively treats 75% of the laser demand. The cooling technology of the GentleYAG is also remarkable. It takes advantage of a patented Dynamic Cooling Device™ (DCD) which cools and protects the skin, while simultaneously the laser light penetrates through the skin to provide its benefits. The DCD process does not require the use of messy gels and improves comfort during the laser procedure. Never compromising safety, comfort or results, DCD by Candela Laser Corp. is arguably the most advanced laser cooling device in the industry. The Candela GentleYAG laser can eliminate the need for shaving, plucking or waxing forever. Traditional hair removal techniques, such as shaving, plucking, waxing and depilatory creams provide only temporary relief. Until the advent of lasers, the only recognized way to remove hair permanently was by electrolysis, which can be tedious, time-consuming and uncomfortable. Our Candela GentleYAG system can uniquely remove unwanted body hair on all skin types without damaging the delicate pores and structures of the skin. The GentleYAG System, with its variable pulse high-energy ND:YAG 1064 laser, emits a gentle beam of light that passes through the skin to the hair follicle where it is absorbed. The laser energy is transformed into heat, which destroys the hair follicle leaving the surrounding skin unaffected. The skin is further protected during treatment by (DCD™) which is desribed above. The GentleYAG selectivity helps to protect the skin, while effectively treating the unwanted hair. Although Dr. Soheir S Ramadan beleives that the GentleYAG is the best hair removal laser available, 100% eradication of hair in any one area is virtually impossilbe by any means. Results vary depending on skin type, power settings of the laser, number of treatments and area of the body treated. 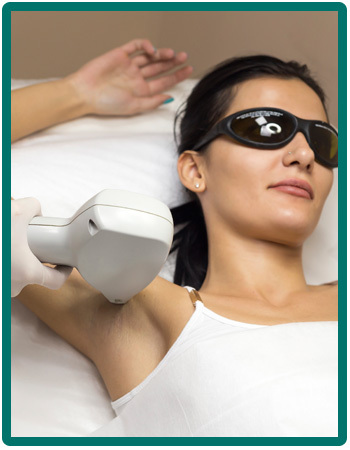 Laser hair removal is often referred to as “permanant hair reduction” because complete hair removal is unrealistic. Laser treament for hair removal can be slightly uncomfortable. To minimize discomfort, your laser provider may intermittently apply ice packs during the procedure or, anesthetic cream is availble to apply before the procedure if desired. Although rare, side effects are possible. They may include redness, swelling, change in skin pigmentation (lighter or darker), bruising or blisters. Side effects do not last more than a few days, and permanent side effects are exceedingly rare. The GentleYAG has defined itself as the “Gold Standard” for treating facial veins, facial telengiectasias and non-varicose leg veins. Since the variable pulse GentleYAG was introduced in 2004, Candela with feedback from its providers, has revised and updated their laser settings to a point where results are near perfect. Moreover, the laser safety profile has improved and there is minimal to no downtime after the procedure. The same DCD cooling and GentleYAG technology apply. Unlike pigment, which is targeted by the laser light in hair removal, the GentleYAG laser light is absorbed by the oxygen carrying component of the blood called Hemoglobin. When the hemoglobin absorbs the energy of the laser, it heats the blood and eliminates the unwanted vessels. Laser treament for leg veins can be slightly uncomfortable. To minimize discomfort, your laser provider may intermittently apply ice packs during the procedure or, anesthetic cream is available to apply before the procedure if desired. Non-invasive laser treaments for facial skin tightening has become a growing trend in our industry. Understanding this trend, Candela Corp. has expanded the applications of the GentleYAG to include facial and neck tightening. Candela’s goal was to offer effective and affordable skin tightening with a laser system that physicians and clients have trusted for years to remove unwanted hair and leg veins. The GentleYAG tightens the skin by heating the underlying layers in the skin and forming new collagen resulting in smoother, younger looking skin. The DCD cooling also applies to this laser application, where it allows quick results and patient comfort. Unlike vein treatment or hair removal, the laser light energy during this process is absorbed by water. The heated water in the vital portion of the skin serves to contract collagen and by thermal injury, lay down new collagen. This process results in tightening the area treated. Dr. Mark Taylor, a dermatologist at the Gateway Aesthetic Institute in Salt Lake City, Utah was the first physician investigator to conduct clinical studies comparing skin-tightening results of the GentleYAG to another commonly used radiofrequency device. The study found the GentleYAG to be superior with respect to efficacy, speed, comfort, and affordability. Clients of Dr. Soheir S Ramadan who have experienced laser tightening have been overwhelmingly happy with their results and found the Candela GentleYAG to be an exceptional way to smooth out wrinkles and tighten the skin. The laser skin tightening procedure is considered a “lunchtime procedure.” It can be performed in under 30 minutes, allowing clients to return to work after the procedure. Short of doing a facelift, or a more agressive/invasive approach, the GentleYAG facial skin tightening offers excellent results without downtime. Laser treament for facial or neck skin tightening can be slightly uncomfortable. To minimize discomfort, your laser provider may intermittently apply ice packs during the procedure or, anesthetic cream is available to apply before the procedure if desired. Dr. Soheir S Ramadan is proud to offer the finest laser technology available. Call us today to experience the frontiers of laser medicine. Schedule a free consultaion today to determine if you would be candidate for the GentleYAG facial or neck skin tightening. For more information, visit www.candelalaser.com. Contact: 732-563-0050 for an appointment.